Skills and abilities: Aizan is a self taught practitioner of par-kour and breakdancing, making her extremely agile and coordinated. Through a special ceremony of The Aizan Clan, some of her mentor’s abilities were passed to her, allowing her to absorb some of his martial arts abilities. Aizan is now versed in the Clan’s martial art system “Anansea Vita Saana. With all of these elementsshe has created a new hybrid unorthodox fighting style all her own. Powers: It has been hypothesized that Aizan is able to cast a psychic aura or “web” that allows her to perceive parallel realities. This manifests in her being able to see through illusions, to the “truth” of reality. Aizan can “read” body movements and actions, giving her the ability to anticipate attacks or even tell when someone is lying. At her highest level she capable of forcing people to reveal truths. At this level she can also “share” her ability, allowing others to see the varied paths their actions could take. This psychic aura also allows her to decipher codes and translate foreign languages. A strange side effect of her power makes her immune to the affects of vertigo. In addition, Aizan participated in a ritualistic ceremony of the Aizan Clan, where certain mental and physical attributes were transferred from her mentor Black Aizan to her. Mental attributes consisting of collected ancestral knowledge allowing her to pool wisdom from numerous past lives of experience; and psychical attributes consisting of enhanced reflexes, speed, flexibility, stamina, durability and agility, slightly above that of a human at peak condition. A combination of the two has gained her access to advanced “muscle memory” martial art techniques. Weapons/Paraphernalia: Aizan utilizes two specially designed collapsible fighting batons. When fully extended an electrical strip can be activated on one side. Along her arms are a total of four removable smoke cartridges. At low level they release smoke to mask her movements, and at high level they can be used as flash-bang grenades. Her costume is an advanced light-weight but highly protective suit that protects her from most minor firearms and damage. Her scarf is made of a hi-tech material with interwoven electromagnetic nanite fibers. As she moves, the nanites are released producing a jamming static that blocks all video frequencies, making Aizan invisible to cameras, video, etc. Aizan has also been known to carry paint cartridges to perform spontaneous graffiti-ing. Biography: Hela St. August was born and raised on the island of Barbados, one of the few places on the planet not heavily populated with an emerging para-human community. The few that were on the island were studied at the medical facility where her mother and father worked as para-human gene researchers. While there, Hela’s mother become extremely ill, and it was hypothesized that exposure to a para-human’s unique energy caused her sickness. Her father tried for years to do his best for his wife, and though a brilliant researcher, he grew frustrated over his many failures to find a cure. This lead to heavy drinking, and him pulling apart from his family. Hela was very young when this happened and began to blame super-powered people for her family’s circumstances. Seeking new help, her father relocated them to the city of Bridgeport in the U.S, where the cutting edge genetic firm Genergy was located. He got a position as one of their top associates, and for many years he threw himself into new research, dedicating himself to finding a cure for his wife’s mysterious illness. It was to no avail, and Hela’s mother died a few short years later. This destroyed the already fragile relationship between Hela and her father, and she decided to make it on her own in her new adopted home of Bridgeport. A rebellious and troubled youth, she eventually became a member of The Sleepy 8s graffiti group, earning herself a rep as a daredevil tagger. It was soon after that the “Street Team war” occurred in Bridgeport City, where a group of vigilantes fought an overlord called Oguun, leaving Bridgeport devastated. Hela’s hatred of the parahuman community knew no bounds. 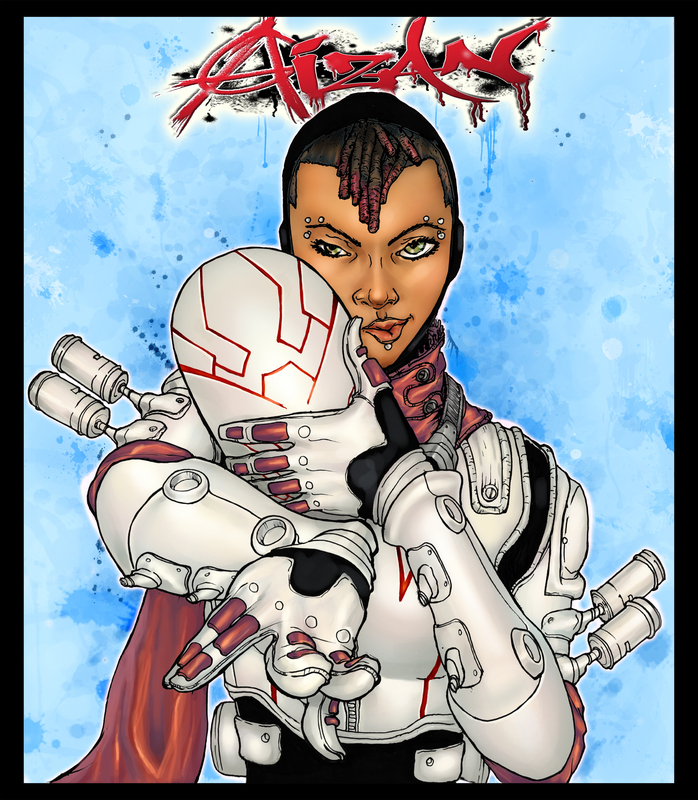 She launched a viral and visual campaign against para-humans and government officials, blaming superpowered people for what she felt was wrong with society. A charismatic philanthropist by the name of Roman Gideon arose to restore the city to its’ past greatness, but Hela saw him as an opportunistic, greedy, government puppet businessman, and sought to expose the truth of his actions. One night while on a raid of one of Gideon’s new development sites, Hela discovered a secret chamber housing numerous para-human beings, and was attacked. She was gravely injured, but was rescued by the city’s notorious vigilante, Black Aizan who, after restoring her to health, revealed to Hela that she was chosen to take on his mantle of an “Aizan”, or protector.